The Private Blend Oud Collection is an olfactory journey that explores three mesmerizing and sensual facets of oud. Two new oud fragrances join the best-selling fragrance, Private Blend Oud Wood, a groundbreaking composition of exotic woods and spices that is hailed as a definitive interpretation of oud. The new fragrances, Private Blend Oud Fleur and Private Blend Tobacco Oud, share the signature elements of the original Oud Wood"oud, sandalwood and patchouli"then follow two unique and contrasting directions. They give Tom Ford another opportunity to show his mastery of this rare and precious ingredient. 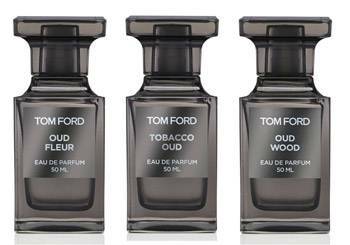 The collection of three oud fragrances also offers three bath and body products that offer sumptuous new ways to wear this unforgettable note, creating a complete world of oud within Tom Ford Private Blend. Oud Wood Body Moisturizer, Oud Wood Shower Gel and Oud Wood Bath Soap are perfumed with the original Oud Wood fragrance. Private Blend Oud Wood captures the most sophisticated, precious and highly regarded materials in the Middle East. Rich, elegant oud is paired with smoky birch tar and cistus heart, which impart a sultry, smoky effect reminiscent of burnt incense lingering in the air, further enhancing the fragrance's depth and sensuality. Adding a perception of warmth and intrigue, notes of patchouli absolute are used as cedarwood Atlas creates a sense of animalic depth, leaving an intoxicating trail. Private Blend Oud Fleur explores the mystique of oud in all its dimensions, including the aspect of prestige and age. It is crafted from a slowly perfected vision of oud wood that has been developed over twenty years by harmonizing the finest aspects of many variations. The oud wood core is streaked with additional woody notes to amplify its effects: patchouli for cool earthy tones; sandalwood for warmth; incense for smoky mystery, and styrax, cistus and leather accord for added texture and presence. Ambergris and castoreum lend a wild warmth and mellow ambery comfort. A complex rose dimension evokes the Middle East's legendary Damascus rose. A blend of Rose Bulgaria ORPUR®, Rose Absolute Morocco, and Rose Absolute Turkey ORPUR® creates a brocade effect that weaves fresh petal, lush nectar and spicy stem-like signatures together. This floral heart is enhanced with ginger CO2, cardamom seed oil ORPUR®, cinnamon bark Laos ORPUR®, and pimento berry; these cool and fiery spice accents awaken the senses. A touch of Geranium Egypt ORPUR® lends a peppery-green flourish as tagette, osmanthus, davana oil and date accord lend a beautifully mellowed effect which enhances the sensation of a precious fragrance crafted from superbly well-aged materials. Private Blend Tobacco Oud explores a secret history of addictive Arabic passions"crafting fragrances from precious oud wood resin and smoking aromatic tobacco. It intertwines mesmerizing oud with an idealized tobacco accord inspired by 'dokha," a blend of herbs, flowers and spice-laden tobacco that was smoked in secret five centuries ago during a ban on smoking"and retains its allure as a widely used tobacco today. Dried quickly in the desert sun, and then mixed with herbs, spices, bark, and dried flowers, dokha delivers its rush in a potent, dizzying hit. Like a proper dokha, Private Blend Tobacco Oud imparts an extremely smooth, warm blend of woodsy notes for a heady buzz; and then a warm exhale of spicy heat. Fine tobacco dust absolute is intertwined with coriander seed oil to achieve this spice-laden touch. Roasted tonka organic absolute soaks the tobacco with a warm, addictive pulse of coumarin while streaks of sandalwood bring out mellow, lactonic tones. A seductive amber note is accomplished with high dosages of cistus oil from Spain and cistus absolute"an indigenous Mediterranean plant also known as labdanum or rockrose"that contributes leathery-ambery, textural tones. The regal oud element is further reinforced by fresh woody facets of cedarwood Atlas ORPUR®"sourced from the Atlas mountain range high in the Moroccan desert"and earthy patchouli absolute, while castoreum complements the primal, animalic aspects. All three fragrances in the Private Blend Oud Collection come in warm gray versions of the signature Private Blend glass bottles. The bottles are packaged in warm gray boxes with a cross-hatched surface and a dark metallic gray label. The Oud Wood Body Moisturizer, Shower Gel and Bath Soap are also packaged in warm gray containers with dark gray labels that are stamped with silver font.